There are a number of sub-species of the Song Sparrow. This very common sparrow is seen all over North America. The larger Song Sparrow (Aleutian) survives on the outer Aleutian islands. 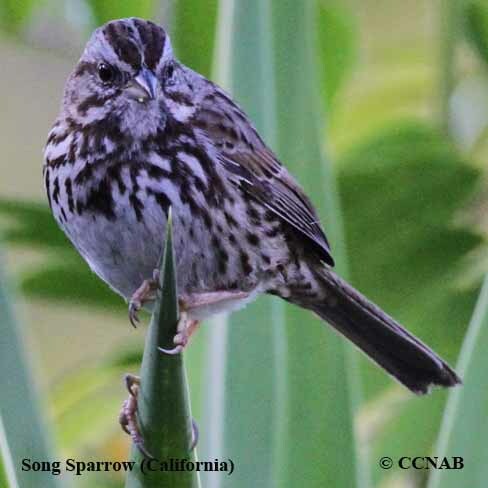 Whereas the dark-plumaged Song Sparrow (Pacific Northwestern) is seen along the Pacific coastlines. Then there is the Song Sparrow (Southwestern), a rufous-coloured Song Sparrow seen in the central regions of the continent. There is also the Song Sparrow (California) and another race described as the Song Sparrow (Eastern) seen in the Atlantic regions. The Song Sparrow is one of the hardier sparrows seen on the continent. There are regular reports of these birds lasting out the cold winter months in Canada and in the northwestern regions of the US. It is seen throughout North America except in the northern tundras. Its song sounds like "Molly put the kettle on".